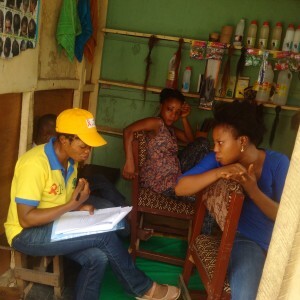 SPACES FOR CHANGE conducted a pilot survey in two informal communities, also known as slums, in Lagos State—Badia East and Ebutte Metta—with the central aim of understanding how women from low-income households living in Lagos slums use and access energy for cooking and for other domestic purposes. It also aimed to identify and establish the linkages between household choice of cooking fuels and kerosene pricing reforms, and use the evidence generated to inform subsidy reform policies, and influence interventions designed to address the health, socioeconomic and environmental impacts of the reforms in the energy sector. Data was collected from 58 female respondents through a pilot survey of residential and commercial buildings in the two selected sampling units. Descriptive statistics has been used for the empirical analysis, mainly to analyse the socioeconomic variables of the household preference for cooking such as age, level of education, marital status, income level, household size, energy mix of households, average kerosene prices, cooking fuel collection time, household energy decision-making, household budget share for energy expenditure and so forth. In part, the descriptive analyses of this survey demonstrate correlations between energy and gender empowerment. A significant positive relationship was also found between household income, affordability and accessibility of cooking fuels. These three major elements, which are of special importance to women, top the list of factors influencing access to energy and household choice of cooking fuels. There is evidence to show that as cooking fuel prices change, often in response to subsidy reforms, residents cope by switching to other cooking fuels that are less expensive, including less efficient ones—such as firewood and charcoal—and reduce expenditure on basic family needs such as clothing and food. The alternative fuels switched to, are not absolute substitutes, but often done to supplement the preferred cooking fuel, and reduce the financial pressure the high price of the preferred fuel places on household income. Urbanization is also a major determinant of energy use, in terms of quantity and type of fuel used, with a number of studies showing disparities in household energy use between urban and rural areas, and between different income groups. Survey results suggest that although living in an urban area may expand user access to wide range of energy products and options, urban poor and low-income residents however, determine which fuel to use based on the availability and affordability of the particular cooking fuel. The ease of getting fuels, the potential for a variety of domestic uses and product reliability, including cultural preferences, are among the key determinants of household energy choices and consumption patterns. For instance, despite massive price increases in kerosene, a decline in kerosene dependency was not witnessed in the urban areas surveyed. The degree of complete switch from kerosene to alternative cooking fuels was not significant. Two reasons account for this: kerosene serves a variety of cooking and lighting purposes and the product is available from mostly informal vendors. Flexible purchasing and distribution arrangements in the locality enhance the product’s accessibility to users. Therefore, we can safely conclude that household energy preferences and the potential to switch to alternative fuels are greatly influenced by not just price considerations, but product availability and accessibility. Respondents live in houses made of wood (34.4%) and block (46.5%). Wooden houses have higher proportion in Badia-East community. Respondents were aged between 20 to 60+ years. 34 % were in their 30s, 25% in their 40s and 20.6% in their 20s. The remaining 24% were in the 50s+ age range. Households in the selected sampling units mainly comprise of 2 – 10 persons, and this is comparative to the NPC data which pegs the average persons per household in the locality at 4. At 31%, the number of female-headed households (HH) in the two localities was statistically significant. Respondents who were not HH heads were predominantly wives (82.7%), daughters (and sisters 3.4%) to the male HH heads. Female-headed households comprised of single mothers, widows, divorced women etc. The majority of women in the targeted areas are educated up to the primary and secondary school levels. 41.3% had secondary school certificate as their highest educational qualification and 24.1 has primary education. 13.7% had no form of education. In terms of the energy mix of respondents, about 27% of respondents use kerosene for lighting, 43% use grid electricity, 50% use generator, 38% use battery powered torch, less than 22% use rechargeable lamps. Women and men can jointly make decisions regarding how energy will be used in the household for cooking and for lighting. 27.6% of households make joint decisions with regard to lighting. In 31% of households surveyed, only the father makes energy decisions for lighting while mothers alone made lighting decisions in 29.3% of HHs. In terms of determining which fuel to use for cooking, women are primarily the decision-makers at 60.3% of HHs, and men accounting for only 12%. Men-only decision-making for HH energy use is also predominant among respondents who either have no income, or earned below N500 ($1.5) daily. 56.8% of women also decide what to do, or how to spend their own earnings. There is evidence of a linkage between female economic empowerment and household decision-making power. Data shows that most women who decide how to spend their own earnings also had a corresponding power to determine which fuel to use for cooking. In other words, when asked ‘who decides how the money women earn will be used?’, the respondents who indicated ‘mainly women’ also indicated that the mother is the primary decision-maker regarding which energy source to use for cooking. In performing their traditional gender roles, women have more need for energy for domestic use such as cooking, laundry, storage etc. Women are primarily responsible for cooking, and 100% of respondents agree. Cooking is primarily done in the veranda/balcony/corridor and or inside the room. In a setting where majority of residents live in Face-me-I-Face-You buildings with shared kitchen and bathing spaces, about 26% cook in the in the veranda/balcony/corridor just as 36.2% cook inside their rooms. Because many people live in face-me-i-face-you apartments that either have no kitchens, or have shared kitchen spaces, cooking in the corridor is the most feasible option. Branded and unbranded kerosene stoves are widely in use, with the Butterfly and Tower brand stoves standing out as the most-preferred. Secondary stoves that are widely used consist of unbranded kerosene stoves and self-made solid stoves. 27.5% are unsatisfied with the performance of their cooking stoves, but 51.7% are content with their kerosene and solid fuel stove performance. Awareness of government welfare programs is generally low. Most questions relating to government assistance programmes elicited ‘I don’t know’ responses. E. g. when respondents were asked whether the government provides assistance to help households purchase stoves. Another instance is when asked whether they were aware government subsidizes the price of petroleum products. Third example relates to awareness of government programs that give soft-loans to low-income women to start or expand their businesses. Awareness of opportunities and information about women-targeted interventions has implications on household energy access in that it heightens women’s prospects to benefit from energy resources. Women living in the informal settlements are largely unaware of government’s welfare scheme proposing to pay 5,000 monthly to the poor. Accordingly, 74.1% say neither them nor anyone they know has benefitted. There is need to understand the criteria the government is using to locate and target beneficiaries. In terms of government’s preferred general support, respondents indicated a wide range of needs such as housing, education, jobs. However, in terms of government’s preferred energy support , cash transfers and cheaper kerosene prices top the list of the most-preferred. Price increases are witnessed often just as product shortages. Respondents recall experiencing shortages, at least 4 times in the past 12 months, indicating a high frequency. Kerosene and petrol prices officially pegged at N150 per liter, and 145 per liter respectively, but respondents have purchased petroleum products as high as N350 from informal vendors. A liter of kerosene sold for N80 per liter in 2015, 150 per liter in 2016 and 260 in 2017. To cope with high energy prices, respondents reduce expenditure on other consumption such as clothes and education, but work more, save less, and ask children to work. Malaria and common cold are very prevalent among adults living in slum and informal neighbourhoods. Among children, common cold, malaria and skin rashes are more prevalent. Caring for children represent a major portion of women’s time and effort. Welfare programmes such as cash-transfers conditioned on maternal and childcare, as with the case of Nigeria’s SURE-P, can help women mitigate the hardship associated with costly medical treatments and inadequate access to healthcare. Replacing less efficient cooking fuels with modern sources of energy can help women save more time, thereby spending saved time on childcare. Diseases prevalent among children can be prevented with greater motherly attention and care. Who in the household procures kerosene fuel, or fetches firewood? Several studies suggest that women, especially poor women in all developing countries, have the principal responsibility and burden of cooking and associated fuel collection. Sharply contrasting with this suggestion, survey results showed that both male and female children are involved in domestic chores, including procuring fuel and fuelwood collection. This observation was also recorded during the Focus Group Discussion in Uzoagba, Ikeduru in November 2016. This rural community in Imo State is also a targeted sampling unit under the research. Families who use biomass fuels responded that both male and female children were involved in purchase and collection of biomass, on an equal basis. This is a trend uniform to both urban and rural areas. Purchasing fuel for household use from informal vendors is very common in the two localities. It is observed that a few more people get their cooking fuel from informal sources rather than from, filling stations. Those who get their fuel from filling stations state that they are generally cheaper and they can be sure of good quality. Those who get their fuel from informal sources state ease of access and proximity to their houses. In addition, some recorded that informal vendors bring products to their doorstep.